We all know about the importance of dressing for success in a business environment, but does this hold true in the gym as well? You bet it does! It turns out that the simple act of slipping into good-looking clothing designed for working out can actually raise your confidence and set you on track to being more active, staying committed to your exercise regime, and improving your performance, according to experts. 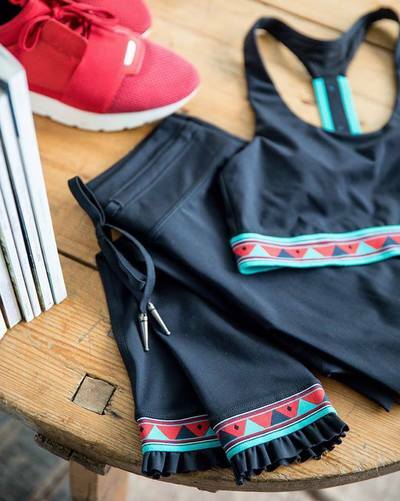 This might not come as a surprise to The Upside, a brand that combines fashion with activewear, but for the rest of us, it’s an excuse to hit the stores before we head to the gym. In order to get the best bang for your buck and come out on top of your fitness game, here are a few tips to shop smartly for your workout wear. Different workout clothes have different features and it’s important to know which technical fabrics and fits are best for each activity. Yoga requires close fitting and super-comfortable pants for the ultimate in stretchability, while running comes with its own clothing needs, depending on the runner. Water-repellant shorts, stretchy leggings with moisture wicking, or compression pants to assist in muscle recovery are some options you might pick along with loose-fitting tops (or those with extra support, as well as sports bras, for the ladies). Opt for whatever outfit you will look the best in at the finish line because in these performance-minded yet good-looking clothes that’s exactly where you’re headed! We all do our best work when we know we look good. That’s simply called confidence. No matter whether you want to lose ten pounds or find yourself sweating up a messy storm on the treadmill, you can still find clothes that will flatter your form. Avoid the baggy jogging pants and ratty t-shirts and instead choose dark colors to give a slimming effect. If you want to conceal your tummy, try a looser top over tights, or to flatter your hourglass shape, wear scoop neck tanks. Some of us love fitness and for others, well, it’s more like eating our vegetables. All the more reason to strike a deal with yourself and have some fun to select workout clothes. While you’re looking for fitness wardrobe staples that will flatter, consider those that will also add a bit of pizazz to your panting. Opt for tops with a bit of added flair like those made with lace-look fabrics, and liven up your exercise regime with prints - from art-inspired designs of florals and foxes to freshly popular camouflage. These days, there are so many options so have fun while shopping, keeping your mind focused on both fashion and function. Whatever outfits you opt to purchase and try out in the gym, on your run around the block, or in the yoga studio, make sure that they are clothes you love to wear and that will help you succeed in your fitness endeavours. The right clothes can make all the difference in so many situations - and working out, as we’ve seen, is certainly one of them! Jeep Clothing - Sale up to 70% off!